2008 was a key year in the history of Auckland Golf, with the amalgamation of Womens Golf Auckland and the Auckland Golf Association into Auckland Golf Incorporated. The combining of men’s and women’s golf administration was a logical step for both Associations to take. However the playing of competitive golf - interclub, interprovincial and national - remains under separate men’s and women’s management committees, each headed by an elected President. On 29th August 1932 a meeting of interested golf clubs was held, which resulted in the formation of the men’s Interclub Pennant Match Committee. This Committee also took over the running of the men’s Champion of Champions event, which had been played since 1929 and the Auckland Matchplay and Strokeplay Championships, which date back to 1914 and 1923 respectively. The original pennants competitors were from Akarana, Auckland, Glendowie, Maungakiekie, North Shore, Otahuhu, Pupuke, and Titirangi. On 7th March 1939 the Committee changed its name to the Auckland Golf Association, with a new constitution adopted to broaden the areas of administration on behalf of member clubs. The outbreak of World War II saw all events suspended, with the Association reactivated in 1946. In 1947 the name was "corrected" to the Auckland District Golf Association. Following a meeting of the Auckland Ladies’ Golf Club (Middlemore) in 1921 the “Auckland Provincial Cup” was held in August 1922. Later events were held at Middlemore, Titirangi, Waitemata and Maungakiekie courses. The first official competition between ladies’ club representatives was the women’s Champion of Champions event; proposed and won by Akarana in 1933. 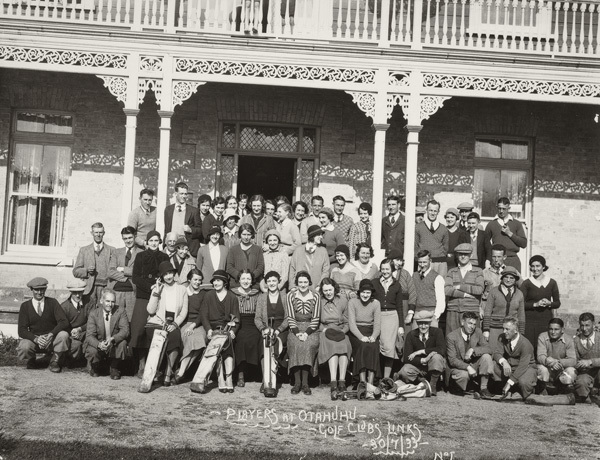 The first meeting minutes to survive were those of the 5th Annual meeting in 1937, with 10 clubs represented – Auckland, Glendowie, Maungakiekie, North Shore, Otahuhu, Orakei, Papakura, Pupuke, Titirangi and Akarana. A proposal for Ladies’ Interclub Pennant matches was recorded at a meeting of club delegates in June 1935. Competitions commenced in 1936 but lapsed after only three years, until a meeting in 1948 resulted in Pennant matches resuming in 1949. The Auckland District Ladies’ Golf Association was formed in 1956 following meetings the previous year; with the first meeting on 5th December 1956 at Kings School in Remuera. 15 clubs were represented. The Auckland District Golf Association sent a letter wishing the Ladies’ Association every success and offering “any assistance in their power”. In the 1980’s, in conjunction with the Auckland District Ladies’ Golf Association and the Eagles Golfing Society of Auckland, the men’s association moved into permanent premises at the Remuera Golf Club headquarters and shared secretarial staff were employed. The Secretary/Treasurer role was replaced in recent years by an Executive Director. The North Harbour Golf Association was formed in 1994 and two years later the Auckland District Ladies’ Golf Association became Womens Golf Auckland. In 1999 the men’s Auckland District Golf Association was changed back to the Auckland Golf Association. The Auckland district boundary currently contains 23 affiliated golf clubs. The administrative structure changed little over the years, with each club represented by men’s and women’s delegates, together with elected Presidents, Vice-Presidents and New Zealand Golf Councilors. A range of committees administer the running of golf, including handicapping and course rating, juniors, match committees and selectors. In recent years a Junior Golf Development Manager has been appointed to assist with the implementation of a strategic plan for junior golf.